We live so much of our lives without telling anyone. But not when we walk through a snowy landscape. Several inches of new snow fell last night and I’m taking advantage of the afternoon light to traipse amongst the trees. I can see by the deer’s cloven hoof prints the place it leaped the fence. There’s the rabbit’s dash-dash-dot and the raccoon’s little paw print. Here a mouse scrimshandered a thin line atop the snow, then tunneled down under. (Such a little creature to face the great winter.) The squirrel’s bounding trail of double dots connects one tree to another, then explodes in a mess of dirt and torn-up earth where it retrieved a buried nut from the frozen ground. Great galumphing footprints behind me testify to my own passage through this little piece of the world. 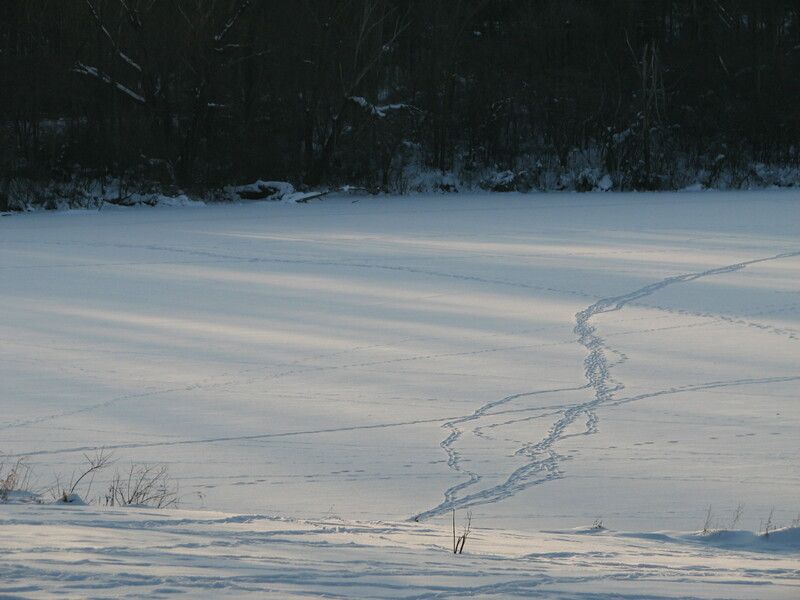 Traces of my presence—and yours—are not always so visible as footprints in snow, though they may linger after we’ve passed. The action centers around nine men at a birthday party. It’s funny, sad and suspenseful all at the same time. The friends trade vicious cut-downs almost as a matter of course. This put me off on a first viewing. Why must they be so negative towards themselves and each other? I’ve watched it four more times, however, and come to appreciate its humor, heart and snapshot of pre-Stonewall gay life. In one scene the embittered Michael confronts his college roommate about the latter’s reaction to a mutual friend’s coming out. This line sticks with me. Even today, the coming out process for many LGBT people is fraught with peril and littered with former friendships. This was true of my experience. My life has been shaped by a society that had no place—no word, even—for someone like me. I carry the scars of my late parents’ eventual and tentative tolerance of me. They were unable to fully embrace me as their son once they learned I am gay. Yet others trail healing in their wake. When I came out at 35 my grandmother was 90 years old and the one person in my family of origin who accepted me without reservation. My mind goes to this scene: Dave and I sit with Grandma in the church she’s attended for nearly 60 years. The pews and paneling are of ash; the aisles carpeted in red with tiny flecks of black. Frosted glass windows discourage daydreaming. Today is Communion Sunday. Grandma learns Dave and I will not be offered the sacrament. Incensed, this little white-haired lady puts away her usual smile and marches up the center aisle, leading Dave and me out of the building. This memory of my grandmother’s show of support nurtures and sustains me years after her death. As she well knew, people do not remember what you do or say, so much as they remember how you make them feel. Grandma made me feel like a million bucks. No, she made me feel loved. Love. Such a little thing to arm ourselves with as we face the great cold. And best shared with another—person, animal, plant, planet. For no matter how many our footsteps upon the earth, our trail is soon ended. A few generations pass; the snow melts and all trace of us is gone.